Well I haven't posted for a while been busy helping finish the extension. At last it is finished, at last I have a kitchen again. Just realized I don't have a photo of it completely finished. Lots of half finished photos so I will post that later. 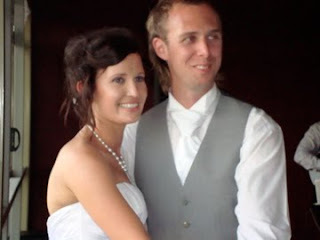 It was my youngest daughters wedding on Saturday. 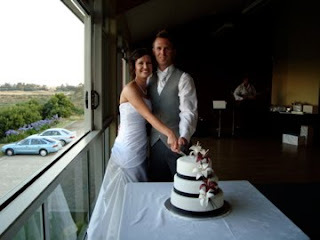 Here is pictures of the happy couple cutting the wedding cake. It was a delicious chocolate mud cake that we eat for dessert with fresh berries and cream. 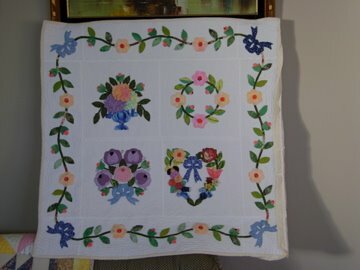 Now that the wedding is over I may be able to get some quilting done.!!!! We had wonderful weather on the day and all went to plan. So well done to the bride for being so organised.